Nobody can accuse the Italian automakers for not being innovative when when it comes to sports cars. Ever since the end of World War II, the two-seater sports cars from Italy have been the envy of the world. When DeLorean and his team of outlaws were set to change automotive history with the release of the first muscle car – the 1964 GTO, the “GTO” name was stolen from Ferrari’s hot two-seater at the time. While America was making fast muscle cars that could clobber the quarter mile when compared to the lower displacement high-performance motors found in Italian sports cars, these Italian motors were high revving but generally had lower horsepower output than America’s potent V8s. However what the Italian sports cars lacked in quarter mile prowess, they made up for in handling and sleek styling that made the American muscle cars seem lightyears behind in these areas. Not to mention most Italian sports cars could reach top speeds which American muscle car owners could only dream of. After-all this was back in the day when even the meanest of muscle cars shortly after the quarter mile would either run out of gear or encounter such intense aerodynamic drag (due to the terrible aerodynamics) that high top speeds just were out of the question. Even America’s sports car – the Corvette back in the day was made more for the quarter mile than high speed driving. Ferrari and Lamborghini were showing the world what fast two-seater sports cars were. Henry Ford II during the 1960s was the lone man in the woods doing battle with the best from Italy. Henry Ford in the worst way wanted Ford to win the grand European races like the LeMans which Ferrari at the time dominated. It was this type of European racing that had sparked the development of most of Ferrari’s offerings back in the day. Ferrari was essentially selling race cars to its customers. Henry Ford was by 1960 the chairman and CEO of the Ford Motor Company and a few years later he attempted to buy Ferrari which would have given Ford the European racing credentials that Henry had sought. When the deal went soar, Henry soon had Ford producing the GT40 to do battle with the best that Ferrari had to offer. Shelby was also during this time in Ford’s corner, and with his Cobra offerings were also helping to give Ford the racing pedigree it previously lacked along with giving Ford some hot two-seater sports cars to put in its showrooms. Things worked in Henry’s favor for a few years and Ford certainly gave Ferrari the cold sweats on the professional racing tracks. However by the late-1960s Shelby walked away from the two-seat Cobra and the GT40 was cancelled – soon Ford didn’t have a two-seater sports car available to its customers. This is where the two-seat De Tomaso Pantera came into the picture. The Pantera was not some Ford derived attempt to compete with the best from Europe which by early-1970s were Ferrari and Lamborghini. No sir, the Pantera was a genuine Italian sports car designed with the same attention to detail that Ferraris back in this era were. In other words this was a lot different than the conditions poor Shelby had to work under where he scrambled to find a body to build his two-seat race car around. The Pantera was from the ground up a new exotic sports car design with all the amenities and sleek lines of a Ferrari or a Lamborghini. However the Pantera had one thing Ferrari and Lamborghini did not have – a good old American muscle car V8 which produced plenty of horsepower and tons of low-end torque. Think of the Pantera as a sleek and awesome handling muscle car built on a mid-engined platform. Nonetheless the best thing about the Pantera was when it was lined up against its V12 powered Ferrari and Lamborghini competition which had a tinny scratchy whiny sound in comparison to the brash and deep rumble of a good old American high-performance V8. Put another way the Pantera sounded like Eric Clapton belting out a guitar solo while the Ferrari and Lamborghini sounded more like a cheesy bass guitar solo at a Yanni concert (don’t believe me, then follow this link to hear for yourself). The price for such a car was not cheap ($9,800 to be exact) for its introductory model year – 1971. However Ford had that covered, it wisely sold the Pantera through it’s Lincoln Mercury dealer network which had more well-to-do buyers walking through its doors than Ford dealerships in general. However $9,800 was a bargain compared to the Ferraris of this era. In order to understand the story of the Pantera, one must first understand De Tomaso which first opened it’s doors as a small Italian automaker in 1959, by the mid-1970s De Tomaso owned Maserati and Moto Guzzi (an Italian motorcycle company) which it owned for another two decades. Alejandro de Tomaso was the founder of the company and built up the company to a formidable force in the automotive world. De Tomaso first partnered with Ford with the 1966 Mangusta which was revolutionary mid-engined car with gull-wing doors over the rear engine and rear storage area. It’s styling at the time was years ahead of what Ferrari was offering. However the Mangusta when compared to its Ferrari competitors had inferior handling due to its poor 32/68 (front/rear) weight distribution. Not helping matters was that Mangusta originally was supposed to be used with only Ford’s 306 horsepower 289 (CID) Hi-Po K-code V8 (which Shelby had pumped up from 271 to 306 horsepower, it was the same engine used in Shelby’s GT-350 Mustang), yet many Mangusta’s were produced using Ford’s lower-output 220 horsepower 4-bbl 302 (small-block) V8. In 1971 the Mangusta would be replaced with the Pantera which in Italian means "panther". 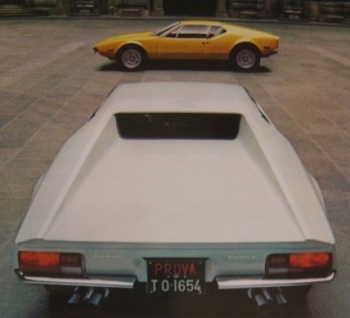 The Pantera was better in just about every way when compared to the Mangusta. The lines were even more striking and futuristic than the Mangusta. The Pantera was one of the finest looking sports cars in the world at this time; it was very low, wide and it had an aerodynamic wedge shape that many future sports cars would later copy. Pop-up headlights also helped the front end to maintain a very low profile. The exact dimensions are a length of 167 inches, a width of 67 inches, and a height of just 43.4 inches. Where the the Mangusta was stuck with 289 or 302 CID V8, the Pantera came standard with Ford’s ultimate small-block V8 of the muscle car era – the 351 (CID) Cleveland V8. It may have been a pushrod V8 with only 16 valves versus the highly advanced overhead cam V12 used by Ferrari, however the 351 Cleveland was a real powerhouse – providing not only lots of horsepower but loads of low end torque. This was different than the other exotic Italian sports cars which you had to really rev the engine in order to produce decent horsepower. With the Pantera the power was there right at a standstill all the way to the 351’s redline. A Pantera could leave a trail of rubber on the pavement that other exotics like Ferrari could only dream of. The 330 horsepower and 380 lb-ft of torque ratings said it all. And unlike all the American muscle cars of this era which could only be had with up to four forward gears, the Pantera came standard with a ZF 5-speed manual (transaxle with five forward gears) so high speeds were very easily obtained. Top speed for the 1971 Pantera was 159 mph. It also went 0-60 mph in about 5.5 seconds and hit the 1/4 mile in 14 seconds at 99.4 mph. These were impressive numbers, many respectable muscle cars back in the day weren’t this fast. Helping the Pantera was its very light 3,123 lb curb weight. And as anyone familiar with the 351 Cleveland motor, it does not take much to add a lot more horsepower with a few modifications. So the potential of making the Pantera faster is almost endless. The Pantera did have one downside – quality and reliability suffered especially during the first year of production. By the 1972 model year quality and reliability improved and kept improving during the Pantera’s around 20 year run. However this was no consolation for owners who encountered problems. Elvis Presley who had purchased a 1971 Pantera for his girlfriend Linda Thompson, was once so angered when this Pantera would not start that he shot it with his pistol (this Pantera currently resides at the Petersen Automotive Museum with the bullet holes still intact). 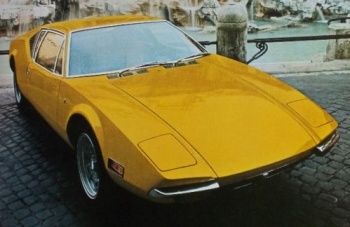 Also worth noting the early production 1971 Panteras as shown in the sales literature had unique outside round push buttons on the side doors for entry, De Tomaso replaced these outside door buttons with more conventional outside rectangular pull handles during 1971 production. Most of the 1971 Panteras that were imported to the U.S. had the outside rectangular pull handles. However when the Pantera did run, it ran very well. Handling was so far superior to the Mangusta that it replaced. The weight distribution had improved over the Mangusta to 41/59 (front/rear). The iron small-block V8 may have produced a great deal of power however it was heavy compared to the small and lighter aluminum engines Ferrari was producing, this extra engine weight in the back hurt the Pantera’s weight distribution. However the Pantera’s handling for its days was still phenomenal. The Pantera used a new steel monocoque frame design which gave the car good chassis strength and rigidity which helped in when it came to handling. The Pantera handled like it was on rails which was to be expected from an Italian built exotic sports car. And when it came to braking the Pantera also shined, stopping from 60-0 mph in just 112 feet. This is one impressive figure even 40 years later, and happens to be around the same distance from 60-0 mph it takes to stop both the 2011 Mustang GT and Camaro SS which are top notch stoppers in the current performance field. As with any exotic two-seat Italian sports car, the two occupants seating position was very close to the floor. Unfortunately this did not help occupants over 6 feet tall since the roof was so low in the Pantera. 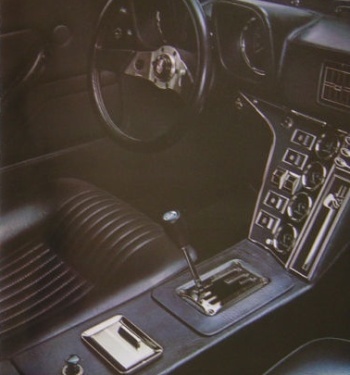 The interior was very well laid out, with all the gauges a driver wanted, only gripe from most owners was the placement of the cigarette lighter which was right where most drivers placed their right elbows. The ashtray was in the same area which must of made for some interesting twisting a turning gyrations for cigarette or cigar smokers. The seating was comfortable however the cabin was cramped but that’s to be expected for an Italian sports car. The steering wheel was close to the driver and as an added bonus the manual gear shifter was just a few inches away from the steering wheel – nice setup for high-speed or race track driving conditions. Visibility was good out the front windshield and out the side windows. And the smaller rear side windows even helped to lessen the big blind spots in the rear. The rear window was more of a portal than a window, it had limited visibility out the back, however this is par for the course for mid-engined cars. You learn real fast in a car like this that your side mirrors are your best friends. And De Tomaso made sure that there were enough luxury options and standard features available on the Pantera so it would be at home sitting in a Lincoln Mercury dealership. Power windows in a Pantera today don’t seem like a big deal but they were a sign of a more upscale car back in 1971. The Pantera may have gotten off to a rocky start due to the production and quality control issues, however those issues and problems were soon overcome. The Pantera lasted through the 1991 model year providing Ford especially during the 1970s (its performance lean years) with a true two-seater performance car. The Pantera was a low volume car that was not advertised heavily but year-after-year the buyers could always be counted on. De Tomaso improved the Pantera year-by-year but kept the formula and the general body styling the same – no other exotic Italian sports car kept a body style as long as the Pantera which is testament to how striking and beautiful the styling was. The 351 Cleveland remained, it lost a little compression starting in 1972 (to meet new Federal fuel standards) but it still provided plenty of punch to devour most of the competition. It was truly the exotic Italian Stallion, a car like Rocky Balboa – it lasted long beyond its prime and continued to win against the odds. Ford could sure use a car like the Pantera today especially since the two-seater mid-engined Ford GT40 was axed a few years ago. Special Note: The black hood air vents shown on one of the 1971 Panteras pictured above was an owner upgrade using later model Pantera hood air vents. This is a popular upgrade since it provides more cool air into the radiator which is located under the hood.